I'm an Italian girl (don't let the red hair fool you), and since I've moved from Upstate New York I've been on the hunt for amazing Italian food like we had at home. My search had been full of meh marianaras and not as good as my Aunt Regina's meatballs. We were invited to dine at Oggi in Ballantyne for the 'Mommy's Favorite Thing to Make for Dinner is Reservations' blog series. BEHOLD, the Italian cuisine hole in my soul was filled with fresh made pasta, to-die-for calamari, and one exquisitely tasty meatball! We had the two tots in tow and they were happily greeted with a basket filled with crayons, coloring sheets and fresh made Italian bread with butter. If my daughter had three wishes, the first would be to live on a diet of Italian bread and butter. So she was happy at the get go. Our waiter explained that Oggi means "today" in Italian and that they chose that name because everything from the sauces, to the pastas, to the bread and desserts are made fresh at Oggi each day - from scratch. The veggies and fresh ingredients are purchased from local growers. We began our meal with two appetizers. First was the boconccino emiliana which were lightly fried croquettes made of risotto and filled with a decadent mozzarella, pesto, sundried tomatoes and presented on marinara sauce - de-lish. The second was the calamari & zucchini croccanti which was slightly spicy, and hands down the best calamari I've ever had. I made the mistake of taking our daughter to the bathroom while we were enjoying the appetizers and when I came back the remaining calamari had quickly vanished into my husbands stomach. Well played Jim, well played. We requested that Eloy, the owner and chef, choose the entrees for us and he was spot on with his decision. Eloy selected the crab meat ravioli served in creamy lobster sauce for me - and oh my. The ravioli were like pillows, light and savory - it's like he knew I am a huge seafood fan. They were unlike any of the dense cheese filled ravioli I've tasted before in other restaurants. This dish has firmly planted itself on my 'must try again' list. On our way to the restaurant I started telling S about where we were going and asked her if she could think of any foods that she had eaten that were Italian. She paused for a moment and said, "Um.. well, yea - a latte." Which left Jim and I in stitches as he asked her "When have you ever had a latte?!" She hadn't, but we all giggled and began talking about her Italian heritage and all the things we thought were going to be on the menu when we arrived. S's favorite Italian dish is fettuccine alfredo, and score, they offered this and many more choices on their children's menu. S told me it was her new favorite fettuccine alfredo place to go. She gave Oggi two glitter nail polished thumbs up. Our son loves marinanra, ravioli and meatballs. He inhaled his portion, exclaiming 'MMMMmm!' He's getting to be such a little person with opinions he wants to share with the rest of us at 19 months old. The restaurant was somewhat quiet because of the time we arrived (5PM on a Monday), so I was a little nervous our LOUD son was going to interrupt other people's meals with his outbursts of excitement or dislike. Luckily the restaurant began to fill as we ate and our kid's voices fell into the background of other diners talking and enjoying their meals. Then came dessert, which was a decadent cheese flan with fresh made gelato, drizzled with caramel happiness. I couldn't think of a more delicious way to end our meal. The kids simply inhaled it as we 'shared' and I savored each bite I was able to sneak. If you go - save room for dessert - you can thank me later. The ambiance home-style casual but posh enough for date nights and MNO's, and the prices are quite reasonable ($15-$20 for most entrees) - especially for the homemade, fresh, quality and quantity of the food. The only down side to our experience was the lack of a changing table in the bathrooms, something I was told the owner is looking into adding soon. 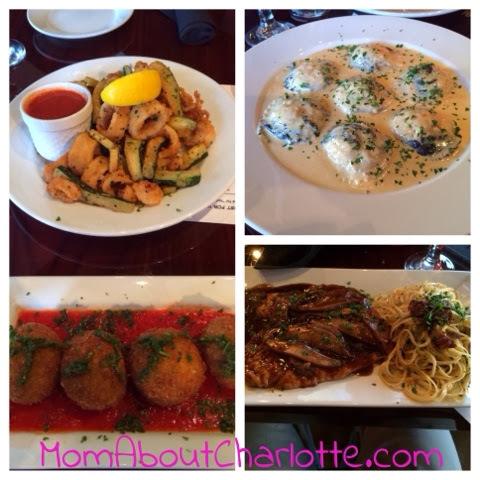 The entire restaurant was clean, trendy and the taste of the food made it an absolute Italian Gem in Ballantyne. I highly recommend trying out this little slice of Italy. 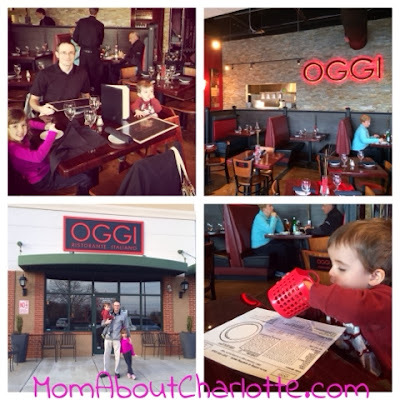 Oggi is a top notch Italian restaurant. All of the food is prepared fresh daily, and it really shows in the quality of the food. Everything I tried was excellent. I could have left happy after the fresh Italian bread and the Calamari & Zucchini Croccanti appetizer (fried calamari and zucchini with a spicy marinara sauce). Fortunately we didn’t, because then I got to experience the rich, delicious Pollo Marsala, featuring a tender chicken breast, sliced Portobello mushrooms, and linguine tossed with fresh garlic. Many higher end Italian restaurants feature $15-$25 entrees but they usually don’t give you enough to eat. Oggi combines high end quality with average prices and good portion sizes. I also give very high marks for the service. Our waiter Joe was very friendly, attentive, and accommodating. 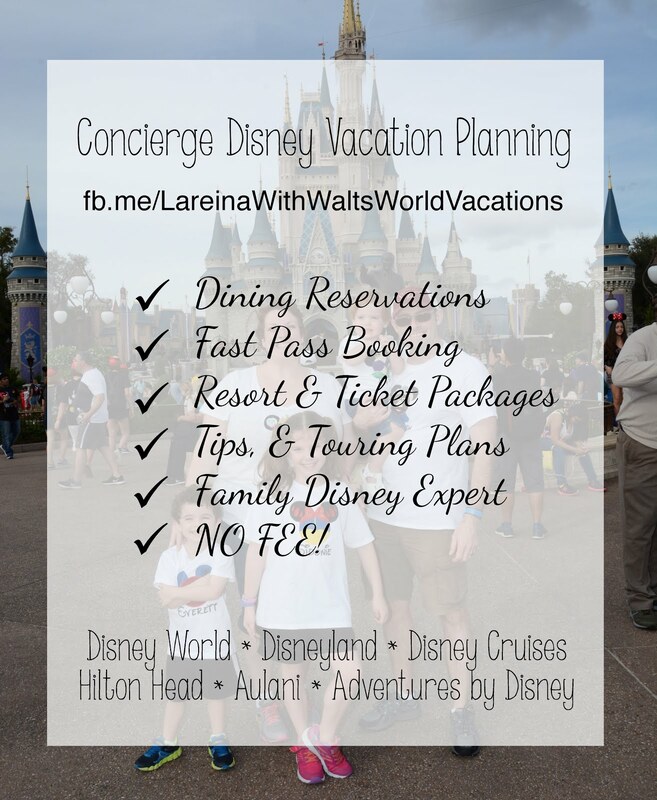 The restaurant is located in a shopping center with an adjacent parking lot so parking was not an issue. If you want to tantalize your taste buds check out their menu at OggiCharlotte.com, like them on Facebook, follow them on Twitter @OggiCharlotte and Instagram. They are located at 16646 Hawfield Way Drive Charlotte, NC in the The Shoppes at Ardrey Kell. Reservations can be made at 704-716-9400. Mom About Charlotte Disclaimer: In exchange for this review, our meals were paid for. However, our opinions are our own, and not influenced by the restaurant providing the meal free of charge. 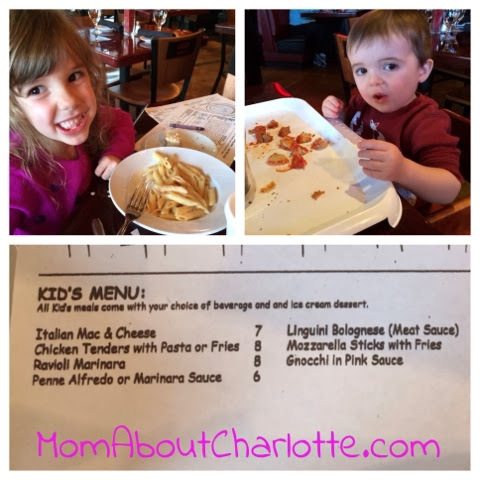 Dining Out with Kids - Like a Boss.